The Central America and Mexico Youth Fund (CAMY Fund) is pleased to announce its renewal grantee partners as part of Round 1 of our 2018 grantmaking. This round contains stellar project leaders from youth-led and mixed organizations doing very important work around improving girls secondary school retention rates; addressing and preventing early unions; supporting young parents and preventing unwanted pregnancies in adolescents. Verlie Rebecca Lamb, 29 years old, will lead Child Development Foundation‘s Project to implement girl club sessions with 250 girls from rural communities in the Cayo District using the organization’s Revitalizing Initiative Supporting and Engaging Youths – RISE curriculum. CDF will provide workshops and materials for 75 parents, 50 community leaders and 12 teachers to increase their support for girls to stay in school. CDF will also advocate for the adoption of a national policy for the reintegration of young mothers into secondary education. Amira Lisette Teul, 29 years old, and Claudia Tut, 27 years old, will lead Toledo Maya Women’s Council‘s project to train young women mentors to lead girl club sessions to strengthen their knowledge and skills around sexual and reproductive health, leadership, financial literacy and social entrepreneurship in four Mayan communities in the Toledo District. TMWC will also coordinate girl-leader conferences to engage 40 community leaders and 200 mothers with the objective of preventing early unions in girls. Benilda Martínez Esteban, 25 years old, will lead Asociación COINCIDIR‘s project to engage in local advocacy to increase the municipal budget and commitment to girls’ education and to achieve the sustainability of the organization’s Center for Adolescent Development. Additionally, Coincidir will provide workshops for 50 out-of-school adolescent girls from 5 communities in the municipality of San Luis Jilotepeque, and will carry out popular education outreach activities and intergenerational dialogues between adolescents and their parents to increase support for girls to stay in school. Gloria Ac Cacao, 24 years old, and Elsa Chutá Gabriel, 26 years old, will lead Corazón del Agua‘s project to carry out an assessment to understand the use, access and need for family planning methods in adolescents and young people in Alta Verapaz and Chimaltenango. It will determine the feasibility of opening a youth-friendly sexual and reproductive health center in Alta Verapaz. Corazón del Agua will also launch a communication strategy to promote the clinic among indigenous young people, along with leading health days and interactive fairs on sexual and reproductive health to benefit at least 500 young people in the communities of Alta Verapaz and Chimaltenango. Joseline Esteffanía Velásquez Morales, 26 years old, will lead GOJoven Guatemala‘s project to provide training and support to public officials in two municipalities for the development of local policy related to forced pregnancies and unions. GoJoven will also disseminate their campaign, #NoForcedUnions, on two radio stations and through a webpage. Kendra Alejandra Avilés Castellanos, 28 years old, and Milena Raquel Oliva Alfaro, 30 years old, will lead Red de Jóvenes para la Incidencia Política – Incide Joven’s project to provide workshops on sexual and reproductive health and rights for 80 students in four teaching schools and to engage them in a photo exhibit on their perceptions of adolescent pregnancy, early unions and sexual violence. INCIDEJOVEN will also engage in national advocacy on policy related to early unions, sexual rights and sexual violence. Esteban Emilio Estrella Rodríguez, 27 years old, and Irma González Neri, 33 years old, will lead the Centro Integral de Atención a las Mujeres CIAM Cancún‘s project to carry out a diagnostic study on sexual practices among high school students in Cancun, Quintana Roo. The results of this study will determine the school site where CIAM Cancún will implement their model of comprehensive sexuality education among 700 students, 30 teachers and 25 young men with reported violence towards their classmates. CIAM Cancún will additionally contribute to the reduction of unwanted teenage pregnancies in the state by strengthening the Quintana Roo Network for Youth Sexual and Reproductive Rights and its participation in the State Group for the Prevention of Adolescent Pregnancy. Melissa Zamora Vieyra, 26 years old, will lead Elige, Red de Jóvenes por los Derechos Sexuales y Reproductivos‘s project to carry out a study on governmental and non-governmental actors and actions related to child marriage and early unions, with the subsequent publication of fact sheets and audio-visual materials on the intersection of child marriage and early unions with other sexual and reproductive health and rights issues and the establishment of dialogues and alliances between different perspectives and movements. Elige will also carry out federal advocacy and organize a national forum on sexual rights and progressive autonomy with non-governmental organizations, public institutions and international bodies. 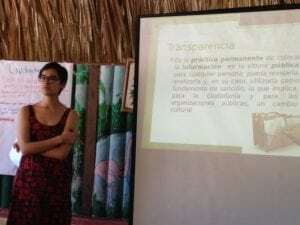 Areli Sánchez Flores, 26 years old, will lead México y Caribe Jóvenes (GOJoven México)‘s project to carry out a mapping of young leaders in the municipalities of Othón P. Blanco and Solidaridad, Quintana Roo. Identified young leaders will be invited to use a “project laboratory” methodology to design and implement outreach and advocacy projects with a focus on preventing unwanted adolescent pregnancy. The young leaders will create alliances with the public and private sectors, as well as with the media to increase their funds and resources in the implementation of their projects. Marco Antonio Hernández Vallejo, 30 years old, and Soledad Hernández Pérez, 24 years old, will lead Servicio, Educación, Sexualidad y Salud (SEEDSSA)‘s project to strengthen the knowledge, attitudes and practices in comprehensive sexuality education (CSE) of 40 teachers from 15 secondary education schools in the municipalities of Solidaridad, Cozumel and Benito Juárez, Quintana Roo while creating a CSE teachers network. Following this training, and with the engagement of 20 school directors and state level school authorities, teachers will implement CSE projects and sessions in the schools. María Betzabe Figueroa will lead Centro de Promoción en Salud y Asistencia Familiar’s (Ceprosaf) project to carry out a study of the knowledge, attitudes and practices (KAP) of nurses and nursing students towards reproductive rights and train them on related issues. The CAMY Fund believes in the capacity of each one of these project leaders, and the strength of their organizations, to achieve positive change for girls and adolescents in their respective countries. Through tailored technical assistance strategies to be provided in person and virtually, the CAMY Fund looks forward to working with project leaders and their organizations to achieve our joint objectives in the coming year. The Central America & Mexico Youth Fund is pleased to announce our new grantees from Round 2 2017, who began their projects late last year. In addition, the Fund is continuing to grow and for the first time we have new grantee partners in Nicaragua. The Central America and Mexico Youth Fund is hiring a new Researcher for a Repository and Web Portal to contribute to a large-scale regional project on child marriage and early marriages. Please click here for the full job announcement (in Spanish only). The Central America and Mexico Youth Fund (CAMY Fund) is pleased to announce its renewal grantee partners as part of Round 2 of our 2016 grantmaking. Read the note here. The CAMY Fund has a comprehensive approach to addressing child, early and forced unions/marriage that is based on strengthening girls empowerment and equality. To read more about our strategy and vision as a donor on this topic, click here.